It’s been two months since I left Toronto for sunny rainy sunny Spain (and nearly a month since my last blog post). Free time is a luxury around here, and I spend most of it in the single-digit hours of the day/night sleeping. That’s not to say that I’m not managing the occasional night out with my friends and classmates, as well as allowing myself to participate in a couple of extracurricular activities now that I’ve got my general schedule and routine down, but spending 12 to 16 hours on campus has become the norm. I never thought I’d find myself looking forward to the opportunity to spend even more time on campus, often returning to work on my projects in the tech labs on weekends. Like weekends, the public holidays have largely been spent catching up on sleep, chores, and homework; save for the fireworks the night before, I missed out on most of the festivities on Valencian Community Day in favour of doing coursework and preparing for my October film cue recording session. We all look out for each other here, though — and the staff and faculty are doing so for us as well — because we all know what we’re going through. There’s a tremendous sense of camaraderie and fellowship. This is the piece I composed in September for Lucio’s class (for which I posted the behind-the-scenes session video in my last entry), inspired by a plot outline for a scene in which a woman wakes up one day in her regular, ordinary neighbourhood to find a rather distressing note. Two-and-a-half weeks later, I was on the podium again, conducting the next cue — this time, with film! Writing this cue was an interesting experience. This cue was a rescore of a scene from Los girasoles ciegos (“The Blind Sunflowers”), which was originally scored by Lucio. I’ve done these kinds of assignments many times before, but never before with the actual composer in the room (not to mention serving as my supervisor and producer)! This exercise was a simulation to partially recreate his experience writing this scene, with Lucio giving us the same direction and music in/out reference timecodes as he had received from his director. I found this scene to be very tense and intense, often catching myself clenching my teeth even while listening to the playback of my demo version. You can only imagine, then, that having my impression of how the cue would actually sound being validated by the live, professional musicians performing it under my baton made the scene feel that much more real — more visceral. So good, in fact, that the feeling of accomplishment yielded to an underlying melancholy afterwards as I allowed myself to be affected by the emotional content of the scene while watching the subsequent recordings in the morning session. In the afternoon following that recording, with barely a break for lunch, I was off to the town of Burriana to serve as a roadie for an ensemble of performers from Berklee Valencia. That’s showbiz! The following week, we were honoured to meet the illustrious Robert Kraft, formerly the president of Fox Music. In addition to hearing him share his experiences about the Hollywood music industry, he took the time to sit in on our classes during the week and review some of our Girasoles cues. Advanced Scoring I: Narrative Analysis continues to exercise our creative muscles. Two recordings down, two to go (one per month). Classes have included reviewing each other’s work (both demos/mock-ups and final mixes), along with watching and listening to examples from both Lucio’s own repertoire and other masters of the craft. Being able to hear actual samples of Lucio’s work is very useful and enjoyable (and makes me hope that I’ll be able to track down English-subtitled versions of his filmography). Computer/Synth Apps for Film (technically a Berklee undergrad course, but part of our program) has so far granted us some degree of proficiency with Digital Performer and Vienna Ensemble. Given that all of us in the Master’s program come from different compositional backgrounds and degrees of technological experience, my impression of this course is that it is intended to bring the cohort up to roughly equal footing on at least one of the standard workstation programs used in the industry. That said, practically no one in our cohort has come here using Digital Performer as a primary DAW, but the benefits of proficiency across many platforms speak for themselves. 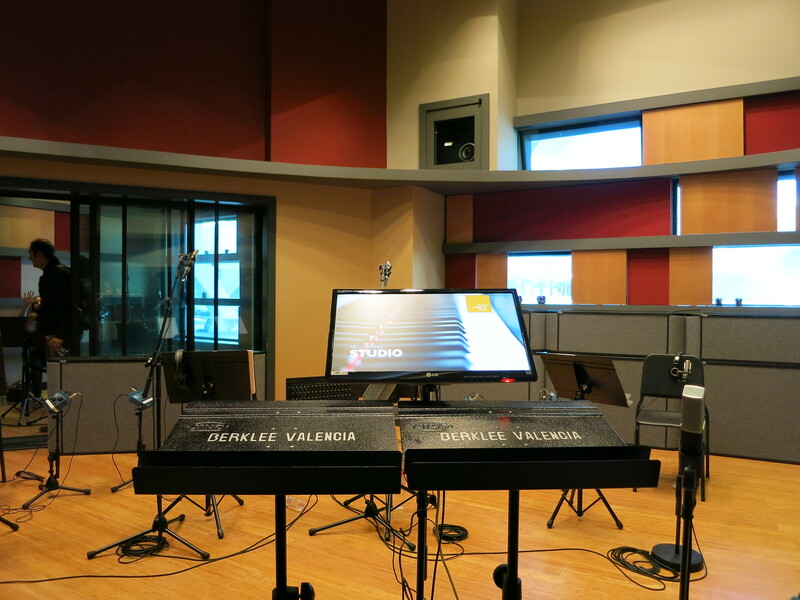 For me, since I’m no stranger to DAWs (having started on Cakewalk — I think v3.0 — at the tender age of 11), I understand essentially all of the concepts that are being discussed (sequencing, signal flow, use of virtual instruments, etc. ), and I’m picking up a few new tricks along the way. The benefit of the class is being guided through the application of those familiar concepts to what is merely a new tool for me; I’ve likened it to getting into someone else’s car and figuring out where — not what — the windshield wipers are. Video Game Scoring Techniques has taken a historical approach to video game composition, with seminars about the origins of MIDI, historical precedents for such musical concepts as cellular/modular and looping compositions, along with giving us opportunities to write our way through history, experience the limitations of our predecessors, and enjoy the technological transitions to more contemporary practices. So far, we’ve been rescoring game-states (menu screen, overworld map/exploratory, battle sequence, etc. ), first writing MIDI to have it played on a mystery chiptune sequencer, then doing a MOD simulation with a limited selection of samples of our choice. We are currently exploring concepts of looping music and transitioning between game states. From the perspective of historically-contextualized writing, this would be the video game equivalent of recreating motets, sonatas, and fugues in Renaissance and Baroque counterpoint classes. Conducting continues to see me refining my technique under the watchful eye of our Film Symphony Orchestra maestro and meeting the challenge of finding the musicality in even our exercise worksheets. The next few weeks will see us include real pieces from orchestral and film repertoire in our conducting practice. Advanced Dramatic Orchestration continues to have us compose our way through the orchestra, writing short tone poems for the instrument-of-the-week inspired by an idea chosen by Alfons. It’s kind of like Iron Chef, which was memorable for its dramatic revelations of the ingredient-of-the-week with a lusty cry of「今日のテーマはこれです！」 (“This is today’s theme!”); I may or may not envision our instructor similarly donning a cape and making a dramatic flourish when he announces our themes (albeit by e-mail). Our themes thus far have ranged from “Days of Awe in the Desert” for flute to “The Celestial Whisper of Wrath” for trombone. Even though many of us Iron Composers already know how to compose for each instrument, these weekly writing assignments give us the opportunity to practice and explore the limitations of the instrument. Our reward is a concert of some of the freshest music on the planet (which often tests the limits of the performer). We capped off our woodwind unit with writing a tone poem for the woodwind section, which was recorded by the four musicians who had been invited previously to give the weekly seminars and perform our weekly marathon of tone poems. In a similar vein, this composition was based on an idea provided by Alfons. Commensurate with the expectations of the assignment, the idea expressed was decidedly more of a narrative. I am currently in the process of editing and mixing the recording. Coming up at the end of next week is a trip to Barcelona for the annual Salon del Manga. Hopefully, the next update will come before the end of November (not that I’m promising much at this point!). As always, my Twitter feed (over on the right-hand side of this blog) is the more immediate way to follow my exploits.